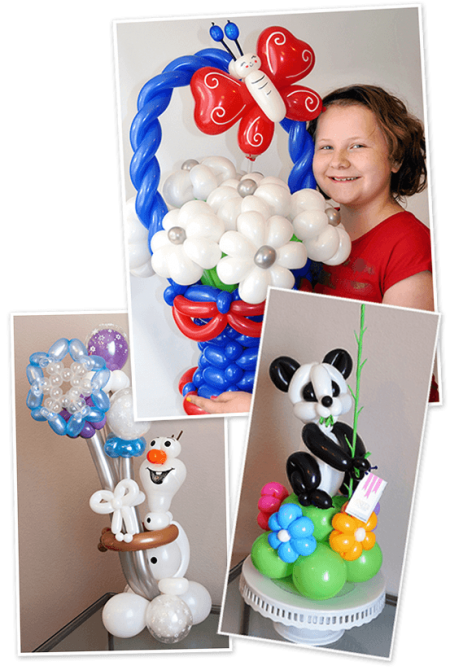 Our balloon artist specializes in unique, custom-designed, custom-made balloon sculptures. For safety reasons, we do not recommend balloons for children under the age of 3. Time scheduled for orders and bookings is on a first-come, first-serve basis. Orders must be placed and paid for a minimum of 72 hours in advance. We recommend ordering at least three weeks in advance. Order earlier for weekends and major holidays when we tend to book up quickly. We accept orders up to six months in advance. Payment is required to place an order. Use the form at the bottom of this page or here to reach out to us for a quote. We will be in touch within 24 hrs. with a quote or recommendations. When you are ready, we’ll email an invoice to you. To place your order, pay the invoice online via credit/debit card by the due date (usually within 3 days). Unfortunately, we cannot hold unpaid dates or complete unpaid orders. If you have not paid an invoice, you have not placed an order. Call us ASAP at 719-345-2826 if you did not receive your invoice or missed your payment deadline. Our hope is that your sculpture will last at least 1 week. Most clients report that with proper care their balloons last even longer. Balloon sculptures are intended to be a temporary form of art. Due to the delicate nature of balloons, we cannot guarantee them for any length of time once they leave our care. To care for your balloons, keep them cool, keep them away from sunlight, and do not squeeze them. We add a non-toxic sealant inside all our display balloons. This additional step helps preserve them longer than typical balloon twisting. You can check our gallery to see if we’ve made something similar before. Please understand that we create art with balloons; we do not manufacture replicas. No two pieces will ever be exactly the same. Even creations in the same theme can be made with endless variations of style, color, size etc. It would be impossible to provide pictures of every variation. To place a custom order, you must take a leap of faith in our artistic abilities based on our other examples and reviews. Clients place custom orders by giving us a few details to work from such as theme, color, and general size. Our best work is accomplished when we have the freedom of artistic interpretation and expression. Scheduled weekday deliveries can usually be made between 10am and 2pm. Weekend deliveries depend on our event schedule. Please be certain there will be someone available to receive deliveries. The nature of the balloons does not allow us to leave them outside. Refunds cannot be given if we attempt delivery and nobody is available to receive it. Get a quote for your custom order. Prices vary, but quotes are always free! Yes, I need a quote for something specific. I have a general idea but need help narrowing my options. I have no idea. I need suggestions for the recipient/occasion..
Google. I saw you at an event. A friend. Facebook. Other. You may describe it here or link to a photograph.